M. K. Gandhi was born in Porbandar, a village in Gujarat province in India in 1869. 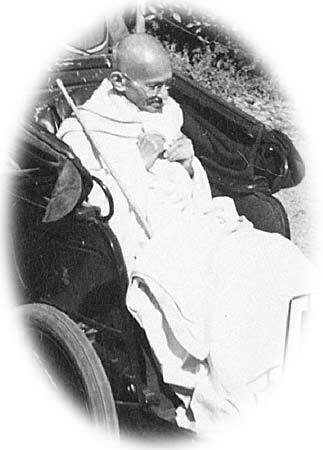 He became the father of Indian independence, and one of the greatest spiritual and political leaders of modern times. His teachings have inspired countless movements and individuals. Unfortunately, the surviving audio material of Mahatma Gandhi is limited. One of the best surviving sound recordings of his voice, it was recorded on the 17th of October 1931 in Kingsley Hall, London. Gandhi was visiting London in connection with the Second Round Table Conference to broker a peave between colonial Britain and the broad Indian freedom movement. It was just before he would be jailed again after the breakdown of the Gandhi-Irwin pact. The title of this talk was "My Spiritual Message." It is likely to have been have pressed on a 78 rpm record in a studio. This recording was optimized by the musician Max Flury in 2006, and part of the musical CD Gandhi 1001 Ways by Andreas Huber. "In my tour last year in Mysore [State], I met many poor villagers, and I found upon inquiry that they did not know who ruled Mysore. They simply said some God ruled it. If the knowledge of these poor people was so limited about their ruler, I, who am infinitely lesser in respect to God than they to their ruler need not be surprised if I do not realize the presence of God, the King of Kings. Nevertheless I do feel as the poor villagers felt about Mysore, that there is orderliness in the universe."